While there are many 2-in-1 laptops that claim to act as both a tablet and a laptop, there’s usually some sort of compromise. The HP Envy x2, a laptop built on the Qualcomm Snapdragon 835 Mobile PC Platform, aims to address that. While some laptops can be used in a tablet mode – either by removing the keyboard or folding it backwards, they rarely offer an authentic tablet experience. The devices are usually more bulky than traditional tablets, and often have a fraction of the battery life that tablets do. These two points can be explained by the hardware the machines run on. Until recently, to run Windows 10 on a device, you needed traditional laptop or desktop hardware, such as Intel processors, which are more demanding when it comes to power. This leads to more heat produced, so larger chassis are needed, and a lower battery life. However, a new breed of device has emerged, of which the HP Envy x2 is part of, which uses hardware more similar to that found in tablets and smartphones. This allows these devices to benefit from longer battery life, thinner and lighter designs, and always-on internet connections with a 4G data connection. The trade-off is raw power, but does this move to a more mobile platform make a case for this sacrifice? Not really just yet, sadly. The HP Envy x2 is available to buy right now, but if you were hoping that this laptop with smartphone innards would come with a budget price, you’re out of luck. Instead, it comes with a very high price of $999/£999. This configuration comes with Windows 10 S installed, an octa-core SnapDragon 835 processor, 12.3-inch 1920 x 1280 display, 128GB SSD and 4GB RAM. This model doesn’t appear to be on sale in Australia. There’s also a configuration with 256GB SSD storage and 8GB of RAM. That goes for £1,199/AU$1,999, yet this model isn’t available in the US. That’s a fair old chunk of change at the best of times, and for that asking price you could get a premium laptop like the Asus ZenBook Flip S UX370 or last year’s Apple MacBook 12-inch. For not much more you could even get the Huawei MateBook X Pro, which currently sits atop our best laptops list. Essentially, by slapping such a high price tag on the Envy x2, HP is inviting comparison with some very accomplished laptops. And, in pretty much every aspect, the HP Envy x2 falls far short. It’s also a fair bit more expensive than the Asus NovaGo, which is probably its closest competitor, as it is also based on the Snapdragon 835 chipset, and costs $699 (about £527, AU$936). When you’re asking for that much money for a laptop, then you’ll need to be sure that you’re offering a spectacular laptop. Unfortunately, the HP Envy x2 is not spectacular enough. The HP Envy x2 positions itself as a 2-in-1 device, but its design is definitely more towards the tablet side of things. The keyboard (which we’ll get to in a moment) easily detaches, leaving the screen to act as a 12.3-inch Windows 10 tablet. The dimensions are 29.3 x 21 x 0.69 cm, which makes it around the same size as an iPad Pro, which has dimensions of 30.5 x 22 x 0.69 cm. In tablet mode the HP Envy x2 weighs just 0.7kg. This results in a tablet mode that really is a tablet. If you’ve ever been dismayed with a 2-in-1 device that has a tablet mode which is essentially a big, thick laptop screen with the keyboard folded back, then you may be impressed with the HP Envy x2. The keyboard, which attaches to the screen via a magnetic connection, does not add much additional weight, with the whole thing weighing 1.21kg. This is because the keyboard is very thin, and is used as a screen protector, much like the keyboard covers you get with other tablets, such as the Type Cover of the Surface Pro. While this makes the HP Envy x2 feel thin and light, anyone who has had to type for long periods of time on this kind of keyboard may despair. While the keys of the HP Envy x2 are nice and large, the shallow travel when pressed makes them feel rather insubstantial. The included trackpad is an improvement, but if you’re working for long periods of time, you may want to look for a laptop with a better keyboard. Also, the keyboard is not backlit, unlike many laptop keyboards these days. It’s a little niggle in the grand scheme of things, but it does make typing in dark environments trickier. Speaking of the keyboard, it's surrounded by a faux-leather fabric, with a loop that holds the stylus. When closed, the HP Envy x2’s design is rather nice, though it doesn’t offer quite as premium a look as some laptops do at this price range. Audio duties are handled by Bang & Olufsen. This renowned brand has worked with HP to tune the dual speakers included with the HP Envy x2, and HP is obviously proud of this fact, with the brand name etched down the right-hand side of the body. Also on that side are two volume control buttons, a headphone jack and something you don’t often see on a laptop: a SIM card tray. This holds a data SIM card, allowing you to access 4G mobile internet, rather than Wi-Fi. We’ll talk more about that in a moment. On the left-hand side there is a microSD card slot and a USB-C port, which is also used to charge the HP Envy x2. As with the SIM card slot, the microSD card needs a small pin to slot in and open it. This is a bit fiddly, and means it’s better used for permanently storing a memory card in the device to expand its storage space, rather than using it to regularly take a memory card in and out. Overall, the HP Envy x2 is a nicely-designed hybrid, with an impressively thin and light design when in tablet mode. The keyboard isn’t great, however, and for the price HP is asking, we’ve seen more stylish and premium looking devices. So, about that SIM card slot. Thanks to the mobile design of the Snapdragon 835 platform, the HP Envy x2 can have a mobile SIM card installed. 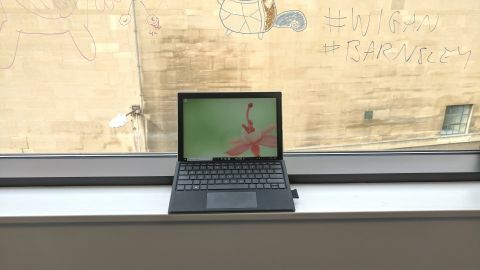 By inserting a SIM with a mobile data connection inside, and configuring Windows 10 to access the mobile network, you get a laptop that is pretty much always connected to the internet. This means you don’t have to hang around Wi-Fi networks to check your emails, and by using a mobile data connection, rather than public Wi-Fi, it’s a lot more secure as well. If you do a lot of sensitive work that requires a constant internet connection, then this is a big selling point of the HP Envy x2. We used the HP Envy x2 with a SIM from EE, a mobile network in the UK which has very good coverage, and excellent 4G network speeds. Having an always-on connection was superb, and it was great being able to work out and about, able to check emails and upload and download documents without having to find an open Wi-Fi network and enter in any passwords. In the future, we’d love to see more laptops come with this ability. Of course, there are some caveats. The first is that this connection is only as good as the network coverage. If you live or work in an area that struggles to get 4G, then this feature won’t be much use. Also, you’ll need to buy a data SIM, or sign up for a contract. This is an additional expense you’ll need to factor in. Check out our pick of the best unlimited data SIM only deals if you’re interested. So, does this feature justify the HP Envy x2’s high price? Unfortunately, not really. Sure, it’s extremely convenient, and the integration with Windows 10 is excellent, but you can get a similar experience by tethering your smartphone to your laptop via Wi-Fi and using your phone’s data connection. It won’t be quite the same, or as convenient, but it comes close. However, always-on internet isn’t the only benefit of having a laptop running on a Snapdragon 835, which we’ll discuss in the next section.